RUSH: New Milford, Connecticut. Bill, thank you for calling. It’s nice to have you with us. Hello. CALLER: Yeah, Rush. It’s an honor to speak with you. CALLER: Thank you for what you do. RUSH: I appreciate you saying that. CALLER: Hey, earlier you had talked about Obama blaming the Republicans on the debt crisis and on the money that’s been spent. You know, since you’re the head of the Republican Party, you might make the point to the rest of the Republicans to say it was during the time where the Democrats occupied both houses and the presidency when Obamacare was rammed through. And everybody knows that Obamacare is probably the single most expensive proposition that was put forth by the Democrats. RUSH: But that wasn’t new spending. That reduced the deficit. CALLER: (laughing) Oh, yeah, right! RUSH: Well, I mean, you laugh, but that’s what he said. CALLER: Well, I know it’s what he said. But, as I said, you had, sometime back, said, somebody has to come up with a message that speaks over the head of the media and over the head of the low-information voters. CALLER: And a message that simply says, “This debt was put into place during the time where the Democrats held all three branches of government…” Well, not all three branches, but at least the House and the Senate and the presidency, it’s very easy to pin it on them. And there’s no refuting it. It’s a very simple message that even a politician would understand. RUSH: Yeah, but… Look, I’m not trying to be a downer, but we’ve said that. The stimulus. You know, the Republicans for the first two years couldn’t stop Obama on anything. RUSH: They didn’t have the votes to stop him on anything, health care or anything else. 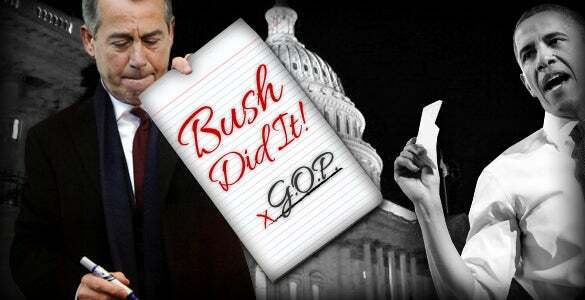 RUSH: And the Republicans still get the blame for everybody. RUSH: Well, it’s interesting. I have a piece here that addresses what you’re talking about. It’s a relatively long piece, and it came out January 8th. It’s in a publication called the Irish Examiner, America’s leading Irish newspaper. I didn’t even know this thing existed ’til I saw this. And the headline: “Low-Information Voters Just Not Interested in Politics,” and what this piece is about is exactly what you’re addressing. How do you reach ’em? How do conservatives reach people who don’t care about politics except maybe once or twice every four years and for a very short period of time. When they are interested, how do you reach them? Let me give you two pull quotes. Here’s the first: “All this year during the presidential campaign, the GOP allowed the Obama campaign to get away with that tax the rich mantra which is all the low-info voters heard.” There wasn’t one Republican opposing what Obama was saying! By the way, The author here is Alicia Colon. She’s right. It’s one of the things that’s bothered me throughout my career. When a conservative, a public conservative gets in trouble, other conservatives tend to throw that person overboard to get rid of the problem, rather than defend them. You know, when Clarence Thomas came under attack, I ginned up the defense. Same thing with Robert Bork. I was in Sacramento then, but I still did. And I don’t care who it was. Ollie North, I don’t care who it was. When they came under attack, I launched a defense of them. The left circles the wagons around their people, but we never have. We didn’t have people defending Romney on the specific charges made against him. The Bush people didn’t even defend themselves on some of the absurd accusations they faced! We just don’t do it. We don’t defend our own people. So the Obama campaign’s out there with the tax-the-rich mantra. “All the Republicans care about is tax cuts for the rich!” Nobody speaks up against it. There’s this little passage, and I would love to know what you think of this. I’m not totally sure I know who the authorette is talking about here, but it says: “Conservatives simply have no one in the media that has any credibility with” low-information voters. “Conservatives simply have no one in the media that has any credibility with the ill-informed masses.” Now, I think that’s true. I also think I know why it’s true. Sadly, I don’t have the time necessary to tell you right now. I must take an obscene profit time-out but I’m gonna tell you why I think this is accurate. RUSH: Part of the answer goes back to the fact that, look at how many conservatives are demonized. Look at how many public conservatives are impugned. Their character, their credibility. That’s what I meant earlier when I said that Obama does not offer solutions to problems; Obama has nothing but enemies that he attempts to discredit and defeat and eliminate. And so when the assertion is made, “Conservatives simply have no one in the media that has any credibility with the ill-informed masses,” I think that’s probably true, and I think I know the reasons why, and they are many and varied. I don’t know who this woman is, but she’s dead-on right. Earlier in the program I made the point that the way to understand what’s happening in the media, Inside-the-Beltway today, right now, at this moment in time, is to understand the objective. The objective is the elimination of any effective conservative opposition. And that goes for the Republican establishment, too. The Democrat Party naturally, and it’s Obama’s modus operandi. The Obama press conference today was all about the Republicans as the enemy, the Republicans as the bad guys, the Republicans would have to be stopped. There were no solutions proposed. There were no policies really proposed. Just, it’s the Republicans’ fault and they’ve gotta be stopped. Inside-the-Beltway Republicans, the moderate Republicans, the Republican establishment feel the same way about conservatives. I shared with you a couple stories, one in Salon.com, the other in the New Yorker, about the effort now to isolate the South because it is an area of heavy concentration of conservatives. By isolate it, mean demonize it. Just a bunch of old-fashioned hayseed sexists and racists and bigots who don’t believe in gay rights, gay marriage. They believe in slavery. They don’t like feminism. It’s just throwbacks. Kooks. They’ve gotta be ignored. Lincoln didn’t finish the job, is the Salon premise. Lincoln didn’t finish wiping out the South. In fact, that’s one of the reasons why the movie Lincoln is getting such attention. It’s to focus on Lincoln. What did he do? He took out the South. All this is happening. And then Ms. Colon says, “Conservatives simply have no one in the media that has any credibility with the ill-informed masses.” I sadly think that’s true. There’s a reason for it. It’s not that conservatism doesn’t fit. It’s not that conservatism doesn’t apply, because Reagan did have that credibility. It’s one of the reasons why the revisionists in history have been so unkind to Reagan. Reagan was profoundly effective and they hated him for that simple reason. And they hate anybody else who is, by the way. So they have to destroy them. Now, the difference is, when they launch assaults, pick your favorite conservative anywhere, elected or in the media, the rest of the conservative establishment usually does not defend that person. They join in the criticism, or they express sorrow and concern and agree that something needs to be done about what that person said. The reason they do this is because they are trying to curry favor with the critics. They don’t want to be criticized as — well, I don’t want to use myself in this. It would probably be the easiest way to make the point, but I don’t want to make it about me. If I use myself in this, I’m gonna come off as whining. Let me use Sarah Palin, because what happened last night at the Golden Globes fits what I’m gonna tell you here. Sarah Palin had to be destroyed. Sarah Palin was saving the McCain campaign. Sarah Palin had to be destroyed. Now, it’s understandable the Democrats and the left, who will always tell us who they fear the most, would try to destroy Palin. I can’t tell you how livid I was when I saw other Republicans joining the premise that she was either an idiot or stupid or uninformed or ill-prepared or unqualified or whatever. I can’t tell you how livid that made me. The left never does that to its people. When their people come under attack, they circle the wagons around ’em and they promote ’em. They elevate them. Dan Rather, classic example, totally destroyed his career in the real world with that phony story on George Bush and the National Guard. What did they do? They gave him new awards. They had dinners in his honor, made sure everybody knew it. Because they knew that they were doing more than protecting Rather. They were protecting the news. They were protecting journalism. They were protecting liberalism. Conservatives are not so inclined. Let Palin come under assault, what did most of the conservative establishment do? Join in, ’cause they didn’t want to be the next Palin. They figure if they join in they’ll show themselves to be smarter than the average dumb conservative and therefore more appreciated by the critics on the left. I can’t tell you, throughout my career when fellow conservatives come under assault, I defend ’em. Clarence Thomas, Ollie North, Robert Bork, you name it. It has become my number one objective to stop these people from being destroyed, if I can. But it doesn’t happen much. It doesn’t happen much in our blogosphere. It doesn’t happen much in our publication media. It doesn’t happen much in our broadcast media. It happens sometimes, but not nearly enough. The most often result is that people distance themselves from the conservative under attack, lest it descend and touch them. So when there’s no defense of a baseless charge, especially when the allegations made about said conservative are dead wrong, stupid, unqualified, ill-equipped, racist, sexist, bigot they’re not even willing to defend people on that. And so conservative people end up being destroyed, in the eyes of low-information voters, in the eyes of people paying scant attention. That’s what they see, and they don’t see any defense of it. In fact, they see other conservatives joining the conversation to one degree or another so that when Ms. Colon writes: “Conservatives simply have no one in the media that has any credibility with the ill-informed masses,” it makes total sense to me why. Anytime one pops up, the left seeks and destroys. There’s no defense. I mean, even during the Bush administration, when they were trying to destroy Alberto Gonzales and any number of Bush appointees and nominees to the federal courts. The Supreme Court, it was the same thing. It’s a very frustrating thing. And so the fact that conservatives don’t have anybody with any credibility with the ill-informed masses is not because there aren’t any. It’s because the effort to demonize them and marginalize them is always so successful. And as that demonization and marginalization takes place, those people under assault find it impossible to broaden their base. Unlike me, they don’t have a microphone to deal with it each day, or a TV show to deal with it each day. And if the people who do are not gonna engage in propping them up and speaking up for them and defending them, then they’re gonna sit there and twist in the wind. And the left is going to successfully tarnish and feather everyone that comes along. Last night at the Golden Globes, Kathryn and I watched this HBO movie Game Change, the movie adaptation of the book. I told you we watched it and if it weren’t for the fact that we were working, we’da walked out. It was a cartoon. The book was not primarily about Palin, but the movie was all about Palin, and it mischaracterized her, it insulted her, it told things that were not true about her, from the standpoint of McCain campaign consultants. People like Steve Schmidt. The critics of Sarah Palin in this movie were other Republicans. How embarrassed of her they were. How ashamed of her they were. How they couldn’t even vote for McCain because they were so afraid that she might someday be president. Well, this show last night won three Golden Globes, and you know why? It won three Golden Globes so that everybody involved could walk up to the stage and once again bash Sarah Palin, knowing full well there wouldn’t be anybody there to defend her, knowing full well there isn’t gonna be anybody today defending her. And once the left targets anybody for destruction, there’s nothing standing in their way. So this is the procedure, this is how it happens. But even last night, awarding this movie three Golden Globes, and Julianne Moore, the actress that played Palin, I don’t know if she won a Golden Globe or not. Tina Fey, the last year that I was on the list of Barbara Walters’ top Ten Most Fascinating Americans, the last time was two or three years ago, Tina Fey was in it for impersonating Sarah Palin, one of the Ten Most Fascinating People. She didn’t make it as Tina Fey, she made it as Tina Fey as Sarah Palin. She ended up being one of Barbara Walters’ Ten Most Fascinating because of her impersonation of Palin. Meanwhile, Palin is not in the list, and yet an impersonator is. So it’s clear as a bell to me why it’s tough to find a conservative in the media with any credibility with low-information voters. Every one of them has been taken out. There are other reasons why conservatives aren’t defended. The conservative movement is in a constant battle for people in it who want to be seen as the leader, who want to be seen as the smartest person in the room, who want to be seen as the go-to person. And so somebody getting a lot of media attention is a threat, just in a high school jealousy sense, is a threat. So you take ’em out, you help take ’em out. It keeps the pathway cleared for you, whoever you are, if you want to be the go-to conservative for the media or the leader of the conservative movement or what have you, if you want to be perceived as such. So competition, lack of unity, fear of the left and a desire to be accepted by them all combine to result in conservative after conservative after conservative being tarred and feathered. And if they’re Tea Party conservatives, it’s even worse. They are universally panned, and they are never spoken up for by other Republicans. Okay, I’m told Julianne Moore did win a Golden Globe. Well, even if she hadn’t won, they woulda sent her up there to accept the award for one of the other three so that she could once again bash Palin, ’cause they never let up. All right, that’s that. I wanted to get that out there because everybody calls here, and they have ever since I’ve been doing the show, “Rush, what can Republicans do?” The first thing they can do is unite. The first thing they can do is unite and start defending each other and not letting this character assassination succeed every time the left tries it.